As many as 430 female students at the Scarborough Secondary School listened to a message of empowerment on November 9 when the Always #LikeAGirlTT Ambassadors visited their school to share inspirational stories with a goal to motivate these young women. #LikeAGirlTT Ambassadors Selisa Jessamy, a 21-year-old Special Needs Teacher and student from Calder Hall, Tobago, and Chelsea Ramjit, a 22-year-old Drama Teacher from Pointe-à-Pierre, Trinidad, participated on a panel led by Nicole Joseph-Chin, who is a social entrepreneur and a leading voice for female empowerment. To provoke discussion, the students first watched a short play performed by April McClashie and Jameel Passie on the potential negative impact of misusing Social Media, a topic that has gained global attention and can affect the health and education of young girls. Like A Girl, which is an international initiative that seeks to empower girls during puberty when they feel their most vulnerable, was introduced locally in early June 2016. Five nominees were chosen, with one woman being selected to serve as a #LikeAGirlTT Ambassador through an online voting process open to the public and two others selected by a panel of judges. Justine Low, a 25-year-old branding and events coordinator from Maraval, emerged as the most popular candidate based on the online voting process. Evangeline Kalloo-Ramdwar, Business Unit Head—Procter & Gamble, Alstons Marketing Company Limited (AMCO), a local distributor of the Always brand, said AMCO remains committed to supporting initiatives that empower communities. “We are pleased that we were able to introduce the Like A Girl programme in Trinidad and Tobago. We want to help build confidence and self-worth in our nation’s youth and needless to say, I think that the best and most effective solution to empower young girls is through such dialogues,” said Kalloo-Ramdwar. In addition to the Scarborough Secondary School, the Ambassadors visited the Barrackpore West Secondary School on Tuesday 08th November as part of their schools’ tour. 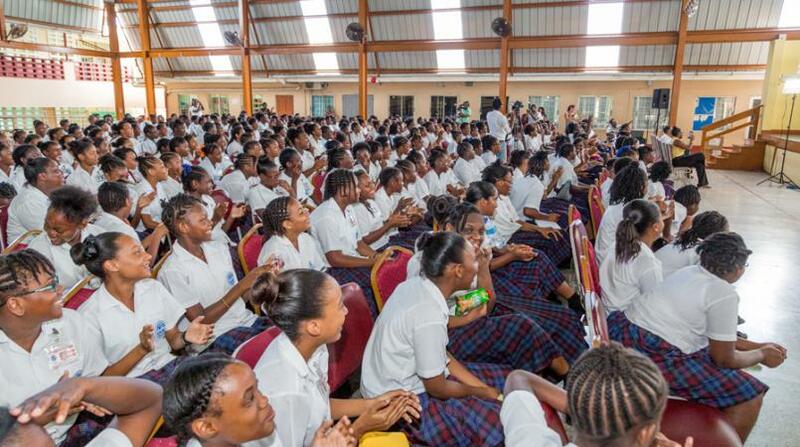 Over 300 female students gathered in the auditorium of the school located in South Trinidad to listen not only to the Ambassadors’ challenges and how they overcame them, but also they discussed using education to empower themselves through creating wealth and leadership opportunities. For persons wishing to learn more about the local Like A Girl movement visit the Facebook page, Instagram @likagirltt or the website at likeagirltt.com.